EDIUS standard layout can be customized for better usability. It is possible to change the size of the preview window, or the bin window, or combine the palettes. It is also possible to register the customized layout. Register operation screen layouts after they have been laid out according to your preference or size. Before you start operation, place the window or palette on the layout you want to register. 1) Click [View] on the menu bar, and click [Window Layout] → [Save current layout] → [New]. 2) Enter a name, and click [OK]. 10 layouts can be saved. To register a new layout when 10 layouts are already registered, select the layout to be overwritten from among the registered layouts in step 2) . You can rename registered layouts. 1) Click [View] on the menu bar, and click [Window Layout] → [Change Layout Name] → layout to change the name. Apply a registered layout to change the layout as you like. 1) Click [View] on the menu bar, and click [Window Layout] → [Apply Layout] → layout to apply. Click [View] on the menu bar, and click [Window Layout] → [Normal] to restore the default layout. 1) Click [View] on the menu bar, and click [Window Layout] → [Delete Layout] → layout to delete. 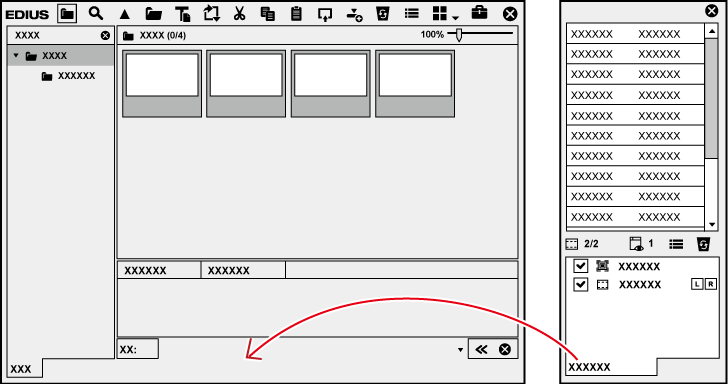 Combine the bin window, source browser window, [Effect] palette, [Marker], palette, and [Information] palette in whatever way so the display area on the screen is utilized more effectively. 1) Drag the palette tab onto the tab of the bin window or source browser window. The palette is combined with the bin window or source browser window, and the tab is added. Click the tab to switch the display window. You can freely combine the bin window or source browser window with any of the palettes. For example, 3 palettes can be combined into 1 palette, or the bin window or source browser window can be combined with 3 palettes into 1 window. To cancel a combination, drag the tab outside the frame. Size of each window can be changed freely by moving the mouse cursor to the edge of a window and dragging it when the mouse cursor changes the shape.